FAITH LAPIDUS: Welcome to THIS IS AMERICA in VOA Special English. I'm Faith Lapidus. CHRISTOPHER CRUISE: And I'm Christopher Cruise. Last week on our program we talked about community policing. We looked at some of the thinking behind modern methods of law enforcement. Today we move from crime to punishment. We talk about the issue of older prisoners. Recently a human rights group expressed concerns about meeting their needs behind bars. FAITH LAPIDUS: In nineteen forty-six, William George Heirens was charged with murder and attempted murder. He was eighteen years old. He was found guilty and sentenced to life in state prison in Illinois. William Heirens has spent sixty-six years behind bars. Yet even at the age of eighty-four he is not the nation's oldest prisoner. The federal Bureau of Prisons says one of its prisoners is ninety-five. CHRISTOPHER CRUISE: Older prisoners are a growing group in the United States, and not because of a crime wave by senior citizens. In fact, crime rates nationwide have been dropping for some time. The main reason there are more older prisoners is because more people serving long sentences are getting older just like other Americans. The nineteen eighties and nineties brought a number of new programs, policies and laws to fight crime -- like the war on drugs. In many cases these new policies meant longer prison sentences. They also meant fewer chances for prisoners to gain early release on parole. At the same time, more people were receiving life sentences without even a chance for parole. Another change involved new laws that borrowed a term from baseball: "three strikes and you're out." The federal government along with California and other states passed laws requiring, in some cases, a life sentence for a third offense. FAITH LAPIDUS: John Paitakes served as a parole board member. He helped decide whether prisoners should be released early. Today Mr. Paitakes is a criminal justice professor at Seton Hall University in New Jersey. He says prison populations grew over the last generation especially because of drug laws. JOHN PAITAKES: "In the seventies there were a lot of mandatory drug laws -- if you possess drugs within a certain feet of a school, a certain amount, if you sold to juveniles. They put some very lengthy sentences on drug distributers and drug users. So that tended to fill up a lot of the prisons over the years." As of January of this year, just over eight percent of all federal prisoners were at least fifty-six years old. The Bureau of Prisons says it was responsible for eight thousand men and women between the ages of fifty-six and sixty. There were almost five thousand prisoners age sixty-one to sixty-five. And there were more than three thousand prisoners age sixty-six and older. Other reports show that in two thousand nine, thirteen percent of all people in state prisons were over the age of fifty. CHRISTOPHER CRUISE: A prison may not necessarily be well prepared to handle the needs of an aging population. As people get older, they may not be able to walk as far, or stand as long or hear as well as they once did. Their dietary and medical needs can change. 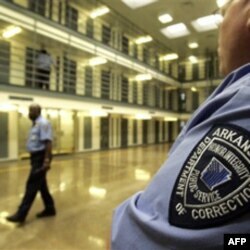 In a recent report Human Rights Watch expressed concerns about the care and treatment of older prisoners. Jamie Fellner is with Human Rights Watch. JAMIE FELLNER: "First of all, the architecture, the physical buildings of prisons aren't designed for older people. Many older people have trouble walking, they have trouble going up stairs, they may be in wheelchairs or be pulling portable oxygen. And prisons have many stairs, or they do not have wheelchair accessible bathrooms. Prisons in the United States tend to be overcrowded and people have upper and lower bunks. It is hard for an eighty-year-old to climb up to an upper bunk." Ms. Fellner has talked to aging prisoners about their concerns. JAMIE FELLNER: "Well, one of the concerns of many of the older prisoners I spoke to was that they would like to get home. They'd like to be able to die with their families if they have families. So that is a big concern." FAITH LAPIDUS: The Access Board is a federal agency that works to support the rights of people with physical and mental disabilities. Starting in nineteen ninety-eight the agency helped bring new legal requirements for prisons. These included requirements like putting handrails along walls to assist people in walking, and making buildings easier to enter and exit. But making older structures more accessible to the disabled can be difficult and costly. Some prisons in the United States are operated under state or federal contracts by private companies like Corrections Corporation of America. CCA describes itself as "the fifth-largest corrections system in the nation, behind only the federal government and three states." The company houses about seventy-five thousand prisoners in more than sixty facilities, most of them owned by CCA itself. A company official says CCA employees are trained to be "attentive to the individual needs of all inmates, including the elderly, and to work closely with the medical staff." CHRISTOPHER CRUISE: Most prisons put older prisoners together with younger ones. But younger prisoners are more likely to act violently to try to prove their strength to others. This behavior can affect the lives and safety of older prisoners. Human Rights Watch says older prisoners should not be required to live with younger ones who might be a threat. Some detention centers are structured to house older or disabled prisoners separately, but not every state has them. Ronald Aday is a sociologist at Middle Tennessee State University. He studies aging and has interviewed more than eight hundred elderly prisoners. RONALD ADAY: "A variety of concerns, I think, that they have would be looking at their deterioration of health within a prison setting, and getting access to health care. Another concern, of course, is their vulnerability, especially if they're integrated with the mainstream prison population. And many of them are oftentimes exploited, physically and psychologically in terms of taking things from them. So they are kind of at risk in terms of those factors." FAITH LAPIDUS: Professor Aday says older prisoners have to deal with aging in a difficult environment, especially one that does not necessarily meet their needs. And those needs can include treatment for mental health problems. RONALD ADAY: "Many of the older inmates do have a lot of mental health issues -- alcohol, drug related, but also just depression and anxiety disorders. We have a lot of our veterans that have come back from different wars, Vietnam and others, that are older now. And they're, many of them, some of those might have been living in streets or they have post-traumatic stress issues. And a lot of those also end up incarcerated." In the past, many of these people might have been sent to a mental hospital. But American society moved away from the idea of keeping people in such institutions. This was replaced with the idea of trying to treat them with medication in the community. But as Professor Aday points out, today prisons seem in some cases to have taken the place of mental hospitals. RONALD ADAY: "Because we have deinstitutionalized a lot of people from the mental health system, but in many cases the prison system has actually become responsible sometimes for taking care of some of those individuals." CHRISTOPHER CRUISE: Taking care of older prisoners can be costly. But releasing them early might require changes in state and federal sentencing laws. California and other states are looking for ways to ease overcrowding and reduce their prison populations. Criminal justice professor John Paitakes says there is growing interest in other sentencing choices besides jail or prison. JOHN PAITAKES: "In other words, somebody does a crime, what other alternatives do we have other than prison? We have some very good electronic monitoring, where either with a bracelet or an anklet we can monitor your geographic area. So instead of going into jail or prison, you can work your job during the day and after that we expect you to be home for the rest of the evening. You're on the bracelet and, you know, you're confined to your home. But it's not the same as jail and it's certainly a less expensive alternative." Professor Paitakes says programs like these are generally used for non-violent offenders. So a drug abuser, for example, might be sentenced to a drug treatment center. JOHN PAITAKES: "In-patient drug programs. There's boot camps that they're using. There's short term facilities and halfway houses. So we do have other alternatives. I think you'll see nationally a lot more emphasis on that and keeping the prisons for more dangerous people." FAITH LAPIDUS: Human Rights Watch says officials should look at how to reduce the population of elderly prisoners without risking the safety of the general public. The group also suggests special training for those responsible for older prisoners. It says one of the greatest difficulties for corrections officers in these situations is learning to practice patience. Human Rights Watch says those who work with older prisoners are the ones who can best decide what needs to change to better care for them. CHRISTOPHER CRUISE: Our program was written by Kim Varzi and produced by Brianna Blake. You can read and listen to our program about community policing, and the influence of researcher James Q. Wilson, at voaspecialenglish.com. You can also find lots of other reading and listening materials for people learning English. FAITH LAPIDUS: I'm Faith Lapidus with Christopher Cruise. Join us again next week for THIS IS AMERICA in VOA Special English. Correction: This story, posted April 23, contains an outdated reference to convicted murderer William Heirens. He died March 5 (he was still alive when the story was being researched.) Also, he was 83, not 84. When Should a Lie Send You to Jail?